Rlc. 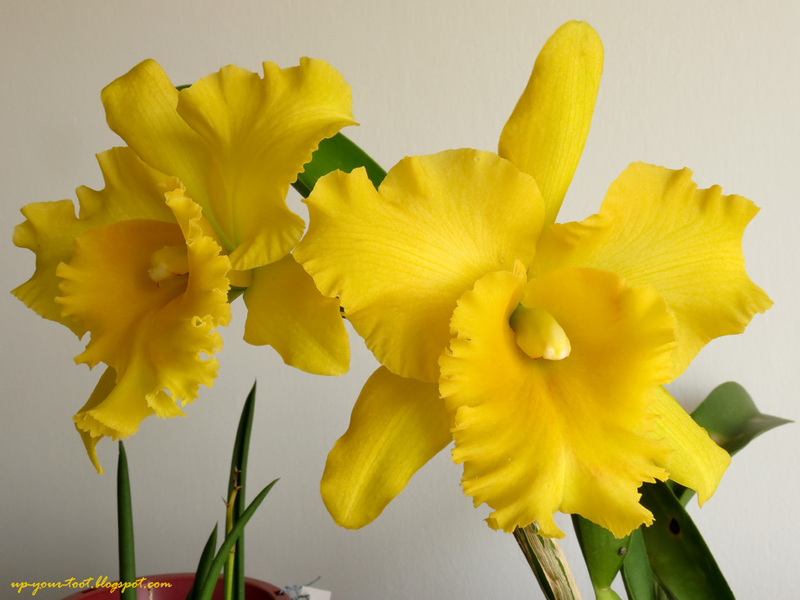 Ploenpit Golden Delight is a bright, canary yellow Cattleya, typically with concolour yellow petals and faint red throat markings on the lip. As with many Cattleyas, the variability in this grex can be startlingly quite different, with some having a red splotch on the lip in lieu of the faint red/orange markings on the throat of the orchid. Rhyncholaeliocattleya Ploenpit Golden Delight - a yellow and faintly red lipped Cattleya orchid. I usually give yellow Cattleyas a miss (read - avoid them like the plague) as they have several issues attached to them that may result in the loss of the plant or the interest in the plant after some time. However, since the flower of this grex is quite stunning and my mum loves bright coloured flowers (Hmmm, I just realised that most of my orchids are yellow in colour or in shades of reds and yellows), I guess I will showcase this hybrid here. Rlc. 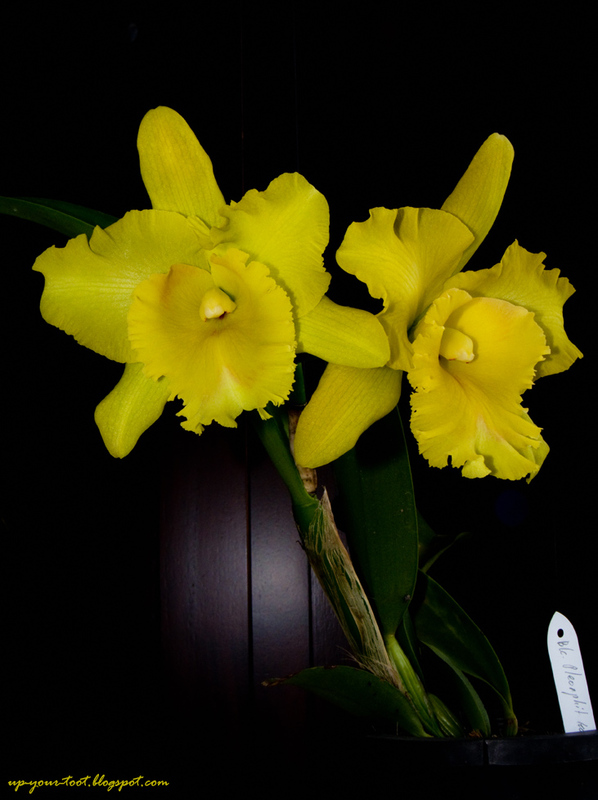 Ploenpit Golden Delight or formerly Blc. Ploenpit Golden Delight is a tough cookie to photograph if you want to get the intensity of the yellow as well as the fine venation on the lips - seen here with a black background. Yellow Cattleyas are not difficult for tropical growers, but they are prone to sulking severely when repotted and also prone to black pseudobulb rot if kept too moist in decaying potting media, besides some genetic issues that can affect the appearance of the flower. The lips of Rlc. Ploenpit Golden Delight is not purely yellow in colour. There are red/orange lines that outline sections of the lip. The plants were on sale during MAHA 2012, and a large plant (blooming size) was less than RM20! The joy of tissue culture is the large-scale production of plants which makes them cheap. Yellow Cattleya hybrids, especially those with a high percentage of C. dowiana in its parentage can be pretty susceptible to black rot if the potting media is too moist. To add to the problem, repotting these plants when there is no new pseudobulb growth will result in a period with no root growth. So if the roots are not in good shape and needs to be pruned off, then you are stuck with a plant that won't make new roots until the next growth emerges, requiring careful misting to prevent the bulbs from becoming severely dessicated. Another issue with yellow Cattleyas is the tendency for its petals to go crippled as the plant ages. Crippling of orchid flowers can be due to many factors, one of them being the genetics of the parent plants involved in the cross. This 'genetic aberration' can be seen in some Vandas and in yellow Cattleyas. Crippling results in the thickening of the petal tissue, usually along the long axis of the petal, as if the petal is attempting to differentiate into another flower part. 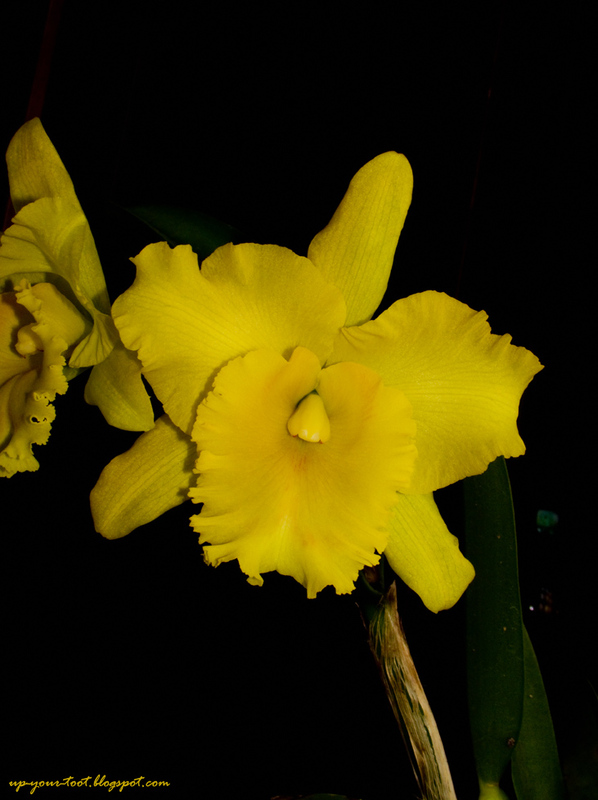 Another attempt to capture the delightfully yellow flowers of Rlc. Ploenpit Golden Delight. This hyrid has been used as both pod and pollen parents for further improvement on yellow and red crosses of Cattleyas. In Cattleyas, crippling of petals due to genetics seems to be age related - with crippling becoming more severe as the plant ages. An interesting article regarding crippling in art shades and yellow Cattleyas that is worth reading up is by Ron Midgett, published in the Bulletin of the American Orchid Society, June 2010 titled A Genetic Problem in Yellow and Art-Shade Cattleyas. Despite the drawbacks of using C. dowiana, it has several good characteristics that gets passed down to its offspring, namely clarity of petal and sepal colour and a pleasant strong scent. C. dowiana is also known to impart beautiful venation of the lips to its offspring, and is very dominant in this sense. These venation are, unfortunately not visible unless inspected closely in Rlc. Ploenpit Golden Delight, for they are of the same colour as the background. 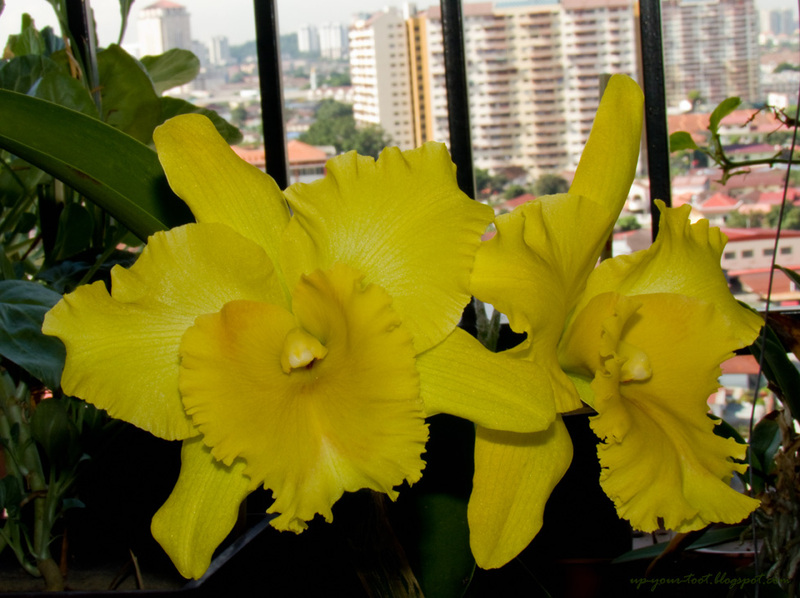 A yellow orchid on the balcony - Rlc. Ploenpit Golden Delight. They remind some people of large daffodils. Unfortunately, C. dowiana also gives its progeny sepals that slowly curl backwards as the flowers age, thus forming a cigar-like tube; this destroys the flatness and the fullness of the bloom. This petal curl is present in Rlc. Ploenpit Golden Delight, which sadly is also weakly scented despite having many beautifully scented parents in its lineage besides C. dowiana. Listed below are the parentage of Rlc. Ploenpit Golden Delight [syn. Rsc./Blc. Ploenpit Golden Delight]. The asterisks*, apetail@ and hash# symbols indicate the parentage of a particular grex that has been described to the root (the primary hybrids). 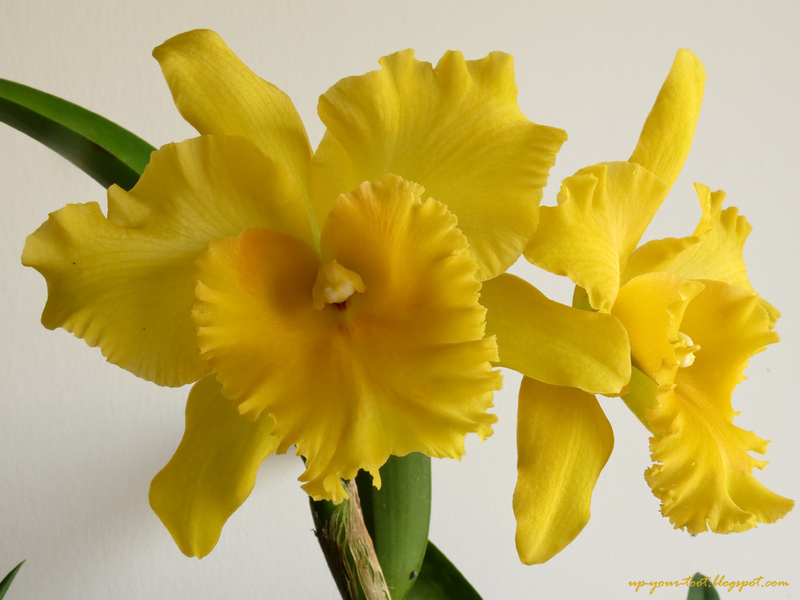 Recent taxanomic revisions of the Cattleya alliance has resulted in Sophronitis being reduced to a synonym of Cattleya by the International Orchid Committee, thus extinguishing the nothogenus Rhynchosophrocattleya, Potinara, Sophrolaeliocattleya and Sophrocattleya. Cantik I thought it was Ms. Daffy at first. Besar bloomnya ya. Ahem... I might have several Orchids for you to help me identify when it blooms. Thank you for the identification. It does look like a large daffodil. I like the yellow, and got tempted. Sure, though orchid hybrid flowers can be tough to identify. Mmm...but I can imagine how easily to be addicted to orchids. For the time being I will refrained myself. I have a bad habit of collecting all I can get once I started. Ooo, cool! Hope you will post the progress of your orchid garden. They are lovely creatures to have in the garden, albeit the extra work and attention that they seek.